Can you make a squirrel house? You might be surprised how easy they are to build. All it takes is a jigsaw and drill, along with a few wooden boards and a mounting device for tree placement. 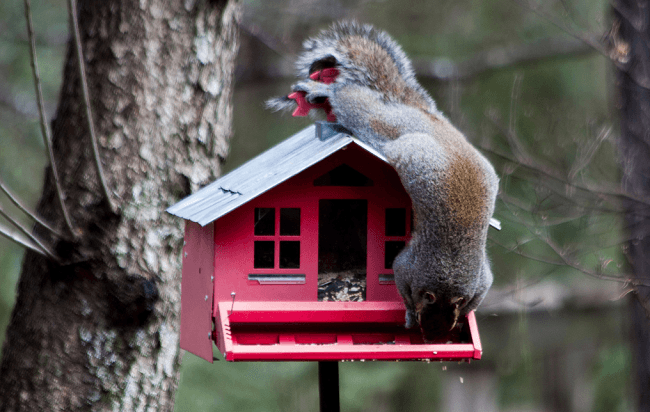 However, building a squirrel house can be even easier when you buy a squirrel house kit that contains prepared materials and assembly instructions. But if you decide to create your unique squirrel house plans, here are a few dynamic designs you might want to consider. Keep in mind that even after preparing a squirrel house and finding it occupied with a new squirrel family, these wild creatures should not be considered as domesticated pets. They have sharp teeth that are used for food, self-defense, and exploration of new surfaces and objects. Each toe has a long, sharp claw that can cause nasty injuries. 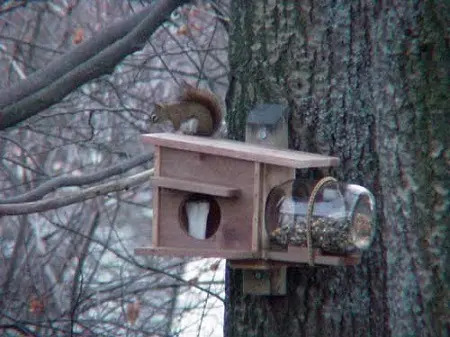 When you mount a squirrel house in your back yard, enjoy watching from a distance, avoiding close-up observation. A squirrel den is a natural-looking structure that is usually made of plywood or a hardwood that won’t rapidly deteriorate outdoors in bad weather. The den is suitable for any member of the family: mother, father, or little ones. In fact, if you’re going to build one, you might want to build three. The mom and dad share a den at first until the babies are born. Then the mama squirrel chases away the father to care for her new babies. Meanwhile, the father lives the bachelor life in a separate but nearby den. Fortunately, after the babies are weaned and leave the nest, Mom and Dad can resume their shared lifestyle while some of the babies may take up residence in the dad’s bachelor pad and a third den. The typical den is built in a rectangular shape with a three-inch opening placed next to the tree trunk for easy access. Length may encompass twelve to eighteen inches in height and perhaps six inches in width. Interior steps or a maze-like pattern are often added between top and bottom to provide natural movement options as well as a storage area for nuts and other foods. You might get lucky and find a squirrel house for sale, or you might decide to build one yourself. Squirrel house designs are readily available to help you plan and build a backyard den or nesting house for your squirrel neighbors. Nesting houses are of special interest since they will house the newborn babies until they are old enough to leave the nest and go out on their own. The nesting house is the living area occupied by a mother squirrel and her babies following their birth. Nesting accommodations should be similar to the squirrel den structure and equipped with a few openings for adequate ventilation. The house should be placed in a south-facing position away from strong winds or heavy precipitation. It can be mounted in a tree or another secluded, well-hidden place away from potential predators. Many squirrel house fans provide not only the nesting house but also nest materials to welcome the babies. Old leaves or manmade soft but firm materials can be used that won’t readily get caught in the squirrels’ claws. The house roof should be sealed to keep out moisture. A perching peg can be added near the door to let the mom or older babies sit outside to eat and enjoy the view. 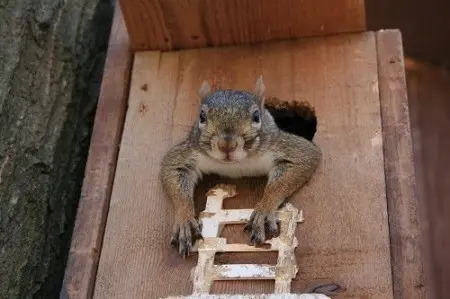 The nesting house, along with other manmade squirrel structures, should be cleaned every three years or so, which will help them last for perhaps ten years. Otherwise, rough weather may cause them to fall apart after just a few years of use. You will love the many adorable themes now available for squirrel houses. 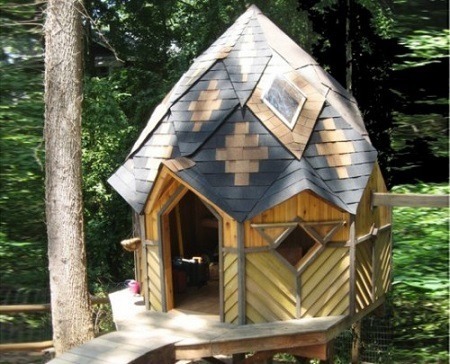 Whatever your interests, you can probably find a squirrel den or house to go with it. There are ranch houses with wraparound porches, gingerbread houses, and storybook houses. There are even castle-type dwellings with observation turrets and drawbridges. You can find squirrel houses made of natural resources like a tree trunk. Fantasy themes and rustic styles are available to go with your yard or outdoor décor. You’ll even find flying squirrel house plans, along with house designs for other species of squirrels. Building a squirrel house will seem more like fun than work, especially when you see the finished product. Gnome houses coordinate well with garden motifs. Your squirrel house or den can be decorated for the holidays or seasons. Changing the look of your squirrel house will be even more meaningful than decorating your lawn since you know there will be occupants that appreciate the house and take full advantage of it. 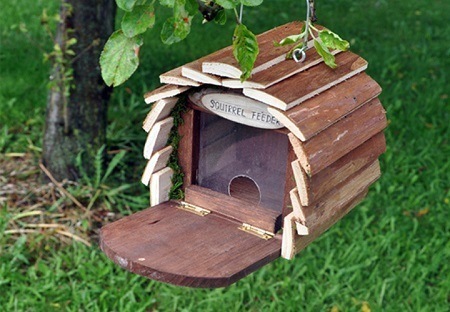 Squirrel housing is available in a variety of colors, styles, and designs. 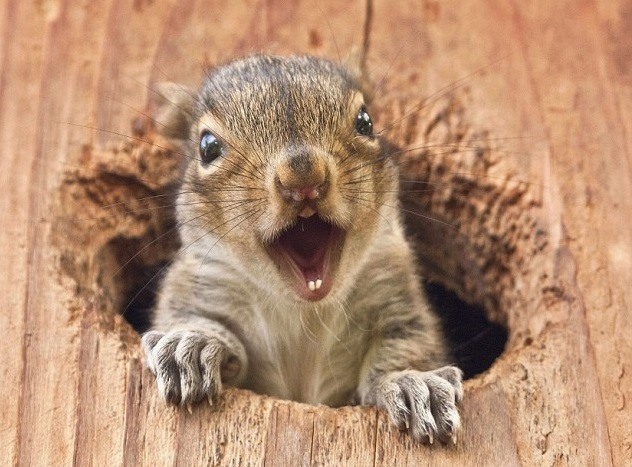 For an even more exciting backyard project, consider building a combined squirrel feeder and nesting box. That type of design provides a convenient feeding place near the nesting area so the mother won’t have to leave her babies alone for long, providing greater protection against predators. Squirrel food can include natural products like harvest corn or acorns. Commercial food is available at feed supply stores and certain pet shops. Watching the squirrels eat, play, and the nest will be loads of fun for everyone in the family. It can also provide an educational experience for children who can observe nature at work in the comfort of their yard. Watching squirrels scamper about can make anyone feel good. Knowing that you are providing housing for squirrel families and food during a cold winter will give you a warm and satisfying feeling. You don’t have to be an architect to create a simple den or nest for your favorite backyard wildlife. Just follow an established blueprint or buy a ready-made squirrel house from a craft store or the Internet. Before you know it, your lawn will become the playground of a squirrel family that you can enjoy.